The Union League of America (or Loyal League) was the first African American Radical Republican organization in the southern United States. The League was created in the North during the American Civil War as a patriotic club to support the Union. It was officially established in May 1863 when a common constitution was adopted. By late 1863 the League claimed over 700,000 members in 4,554 councils across the nation. After the Civil War the League spread throughout the South mainly but not exclusively among the freedpeople. Paid organizers, including freedmen advocates and anti-Confederates from Unionist clubs, went south to promote the League, and loyalty to the federal government, in the ex-Confederate states. Many newly freed slaves, or freedmen, saw this as an opportunity to seek fair treatment and equal rights from the federal government and the state governments. By the summer of 1867 thousands of freedpeople had joined the league and it became a strong political force. Due to fear of terrorist groups such as the Ku Klux Klan, the league met secretly in member’s homes and at churches where they discussed issues of concern to them including homesteading land, public school rights for their children, and securing opportunity to testify in court. They were engaged politically by petitioning, striking, and organizing campaign rallies. Increasingly because of the Union League more African American political leaders emerged in both the North and South. The Union League also exercised social influence and addressed agricultural concerns. It campaigned to end plantation agriculture and promote land ownership among the ex-slaves. The success of the League angered terrorist groups like the Ku Klux Klan which increased its violence against the organization. The League was a major target of the Klan during the 1868 presidential election which was the first national contest in which African American men voted. By 1869 the League began to decline. It lost power as its membership declined. By 1872 only a few League councils survived. 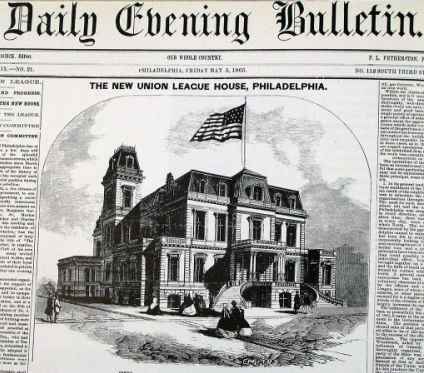 Although the national Union League experienced a short life, its importance and its legacy made history as it introduced thousands of freedpeople to American politics. Phyllis Field, “Union League,” in Nina Mjagkij, ed., Organizing Black America: An Encyclopedia of African American Associations (New York: Garland Publishing, 2001); Michael Fitzgerald, The Union League Movement in the Deep South: Politics and Agricultural Change During Reconstruction (Baton Rouge: Louisiana State University Press, 1989).